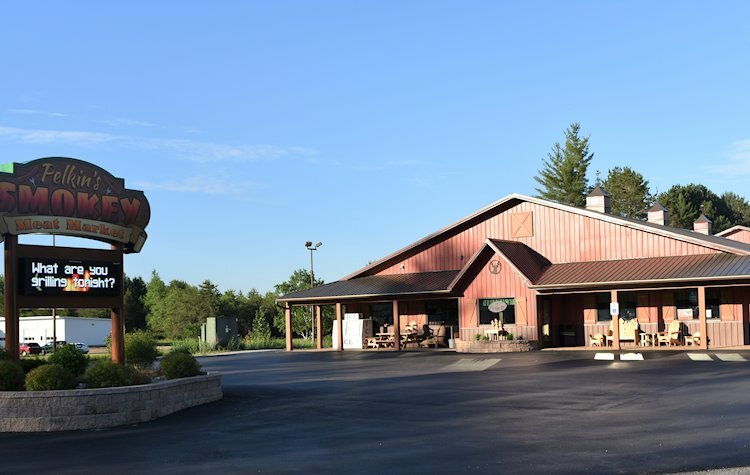 Started in 1973, Pelkin's Smokey Meat Market in Crivitz Wisconsin, is a full service butcher and custom meat processor and has become a ‘must stop’ for those camping, hunting and grilling out in the north woods of Wisconsin. We will ALWAYS do our best to see that you are 100% satisfied. Pelkin's Smokey Meat Market complies with all state regulations. Our facility is Wisconsin State CIS (Federal) inspected and HACCP certified. We offer Custom Meat Processing - Beef, pork, lamb, goat, and wild game butchering, (beef chilled and dry aged, pork hickory smoked and sugar cured, and wild game sausage or steaks). We offer custom butchering from: Whole, Half , Split Half Beef (market Price), and Whole, Half Hog (market Price). We walk you through every step of the process and tailor every order to your specific wants. Wrapping can be freezer paper wrap or vacuum packed. We have a state of the art Venison hanging cooler with a capacity to hang 325 animals. We hand craft fresh and smoked sausages, using USDA Choice cuts of meat. We offer a wide variety to choose from with over 70 flavors of bratwurst and over 30 flavors of snack sticks. We offer a variety of MSG free and nitrate free smoked products. We offer curing and smoking of fish and turkey. We offer a fresh meat counter with select cuts of American meat, cut daily in house to insure quality. You'll love our EXTREMELY COMPETITIVE PRICES. Come shop and compare our prices to your local supermarket's. You'll find our prices offer you higher quality cuts of beef and pork at prices that won't roast your budget. We offer grass fed beef, buffalo, lamb, and goat select cuts of meat. We offer a wide variety of fresh and saltwater fish and seafood. 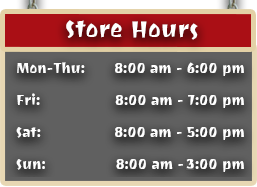 We offer a full North Woods Country store with numerous spices and cheeses.